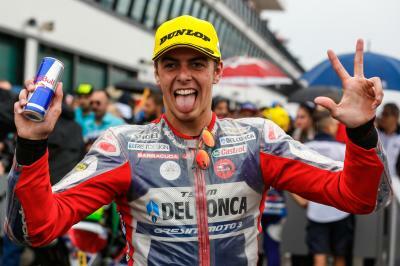 Fabio Di Giannantonio (Del Conca Gresini Moto3) hit the top late on Friday at the San Marino GP, going fastest in FP2 and therefore fastest overall as all riders improved in the afternoon following a damp start to the day. 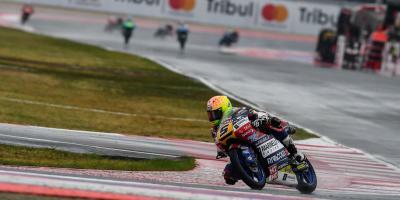 Teammate Jorge Martin was second quickest despite not running the risk of testing the conditions in the morning, with Enea Bastianini (Estrella Galicia 0,0) – winner in 2015 and second last year – keeping some good momentum after his podium at Silverstone to go third quickest. Gabriel Rodrigo (RBA BOE Racing Team) was P4 as he continues to show his great pace of late, ahead of two key men at the top of the standings. 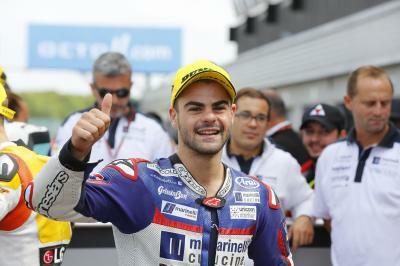 Romano Fenati (Marinelli Rivacold Snipers), currently third in the Championship, was the first of title challengers in P5, ahead of points leader Joan Mir (Leopard Racing), who was sixth quickest overall. Marcos Ramirez (Platinum Bay Real Estate) was quick to bounce back from Silverstone in seventh, ahead of compatriot Aron Canet (Estrella Galicia 0,0), who went fastest in FP1 and had a fast lap deleted in FP2 - leaving the man second in the standings in P8. 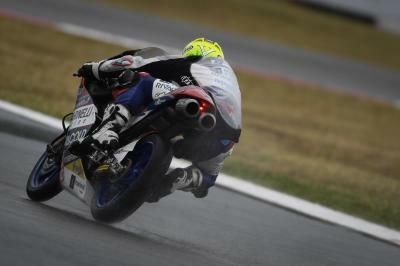 Two home heroes completed the top ten: Niccolo Antonelli (Red Bull KTM Ajo) and Marco Bezzechi (CIP). 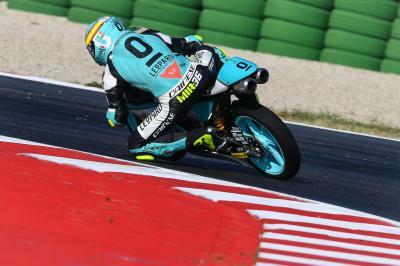 Just outside that top ten but knocking on the door was Livio Loi (Leopard Racing), who headed Sky Racing Team VR46’s Nicolo Bulega as the former Moto3™ Junior World Champion ended the day in P12. Bo Bendsneyder (Red Bull KTM Ajo) took thirteenth, ahead of Adam Norrodin (SIC Racing Team). 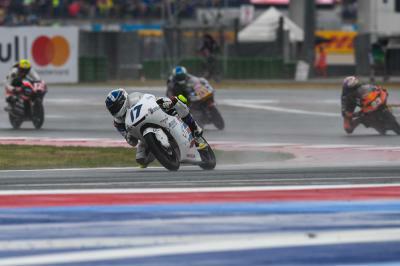 Second Sky Racing Team VR46 rider Andrea Migno – winner at Mugello – locked out the fastest fifteen. 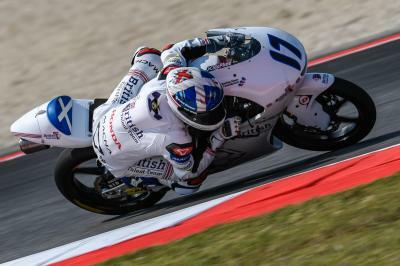 There was a performance of note from wildcard Kevin Zannoni, as the Althea Racing rider took P17 overall on Day 1. For full results from FP2, click here! The second Free Practice session of the weekend in the Moto3™ World Championship at the #SanMarinoGP.